I am here just chiseling away in my closet. Gosh, it’s weird how you really don’t know how much you have until you start digging and pulling out from all the nook and cranny. What I did FIRST was I took everything that was in the middle of my closet OUT. 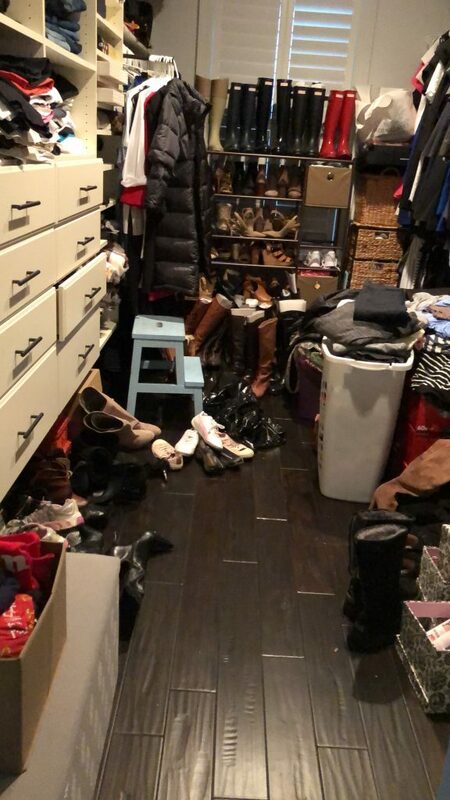 Once I got all that out…I went through what I wanted and NEEDED and donate or throw away. Next, I moved onto the individual drawers/shelving. I also wipe down and swept up all the dirt and dust that had been collecting on the floor. I also wipe down my windows and TOP shelving. I clean out EVERY single drawer…I didn’t want to get overwhelmed so…I only took out 1 drawer at a time haha. 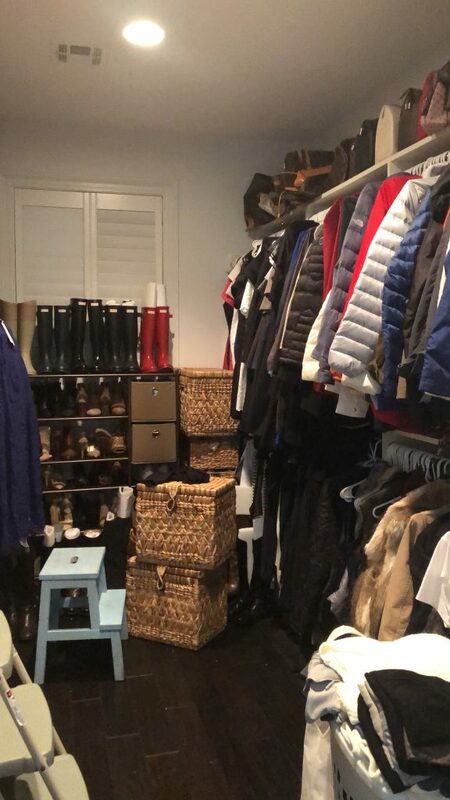 After all my drawers were done…I moved onto the shoes and boots. I tried them on and see if they still fit or if any of them were damage and etc. I donated the ones I don’t want and threw out the ones that had some miles to them. I was trying to find some sort of way to store/organize them. So, what I did was I got a BIG FABRIC container that had a lid….I would organize them by season. I put all my sandals and MOST of my heels away …I left all my boots and winter shoes out. When the weather starts to warm up…I will rotate them out. The shoe container fits perfectly under my built in drawer. It works out perfectly because its covered so it wouldn’t get dusty. Up next will be my hanging clothes. This process will take me at least 1-2 weeks….because I have been working 8-4:00 pm —5 days a week…then kids after school activities so I am just gonna be able to give this project about 30-45 minutes everyday. So stay tune….I will keep you guys updated. 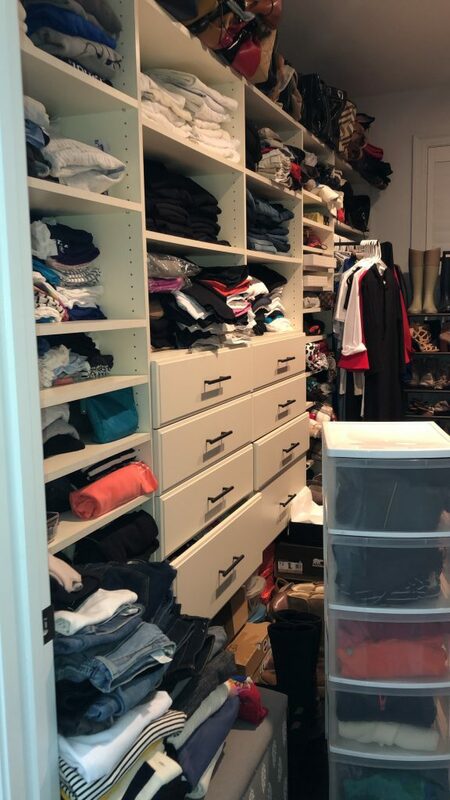 I had a HUGE plastic drawer in the center of my closet…I got rid of it. 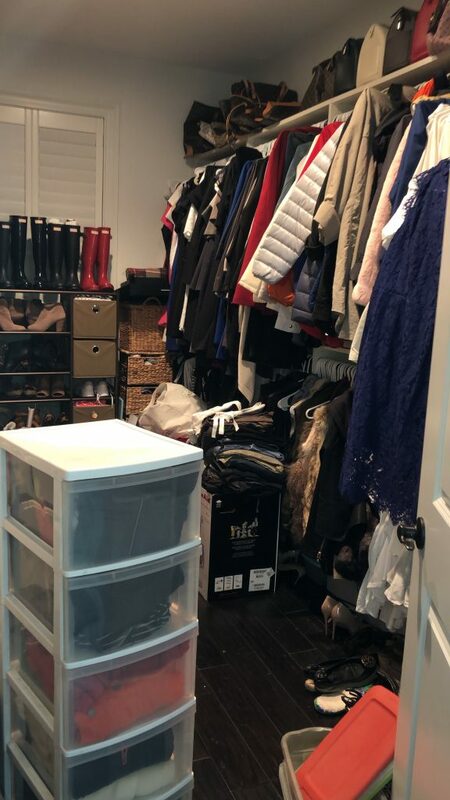 I wanted everything to be able to fit inside my closet and in the drawers that I already have. I got the plastic drawer out and starting to clear out more items on the floor. Starting to clear out…I only want the wicker container to be in the closet for now..I am using it as a place to store my items when I am emptying out the drawers. Still debating if I want to keep it in the closet or not. 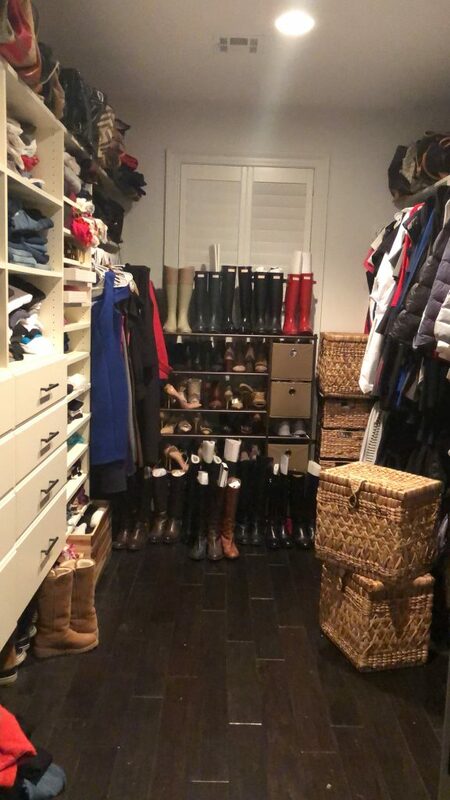 Got most of my shoes and boots nicely arranged and off the floor. Organize the summer and winter shoes. My jeans and pants are nicely folded. 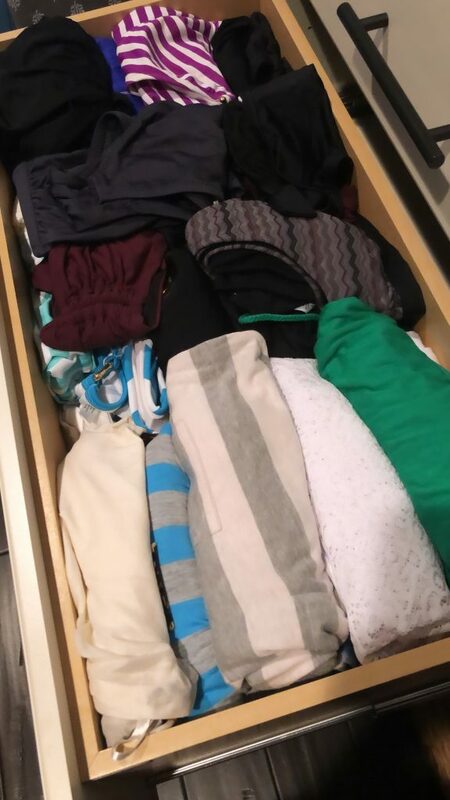 I been folding my clothes like this for the past few years. 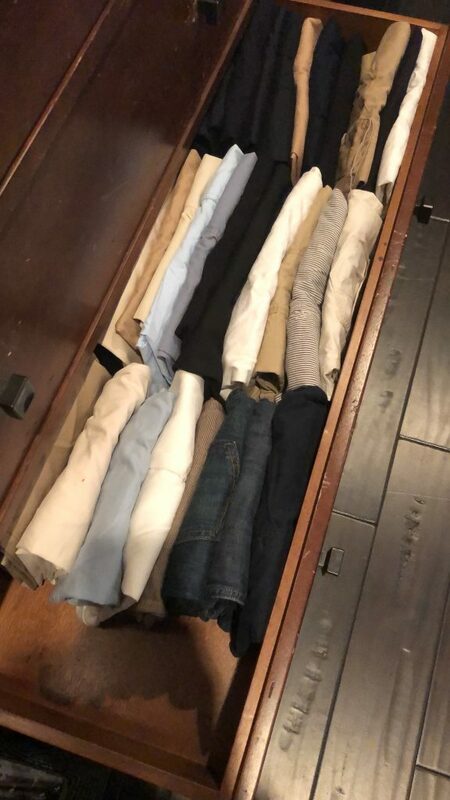 I either fold or roll my clothes…but since this drawer is deep….I fold them so I can see what I have. This is my swimsuit drawer..it contains everything from bathing suit to coverup to all my swim GEARS. I used to work at VS so I have been folding my bras like this for the past 20 years. I used to hang up my sweater….until I found out that it stretch them out…when I was working at the GAP. So, I fold roll them into my drawers…I pulled 1 out to show you how it looks all roll up. 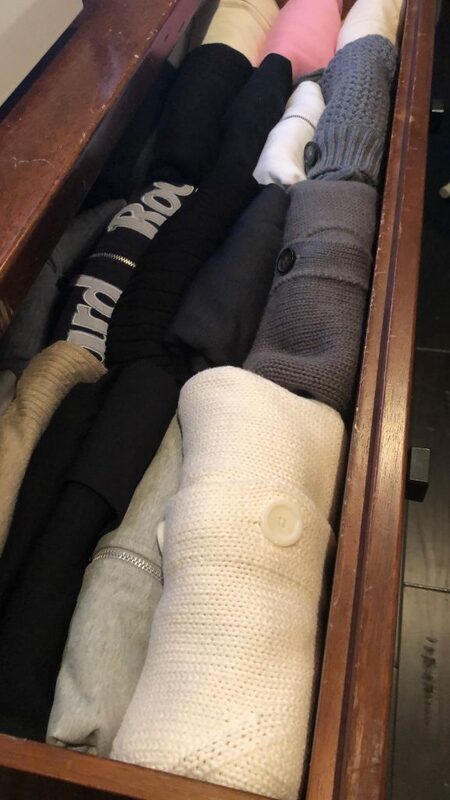 Sweater are so thick so rolling them up makes them fit perfectly in my drawer. I started with my closet a little over a week. My closet is something that I have to admit..I have been tweaking it everyday since I started. I am still searching for a better system…that works for me. I will KEEP YOU POSTED on my progress!!! Have a HAPPY TUESDAY!! !